The Tippmann X7 Phenom SWAT Integrated Rail Carrying Handle has a built in rail system that allows you to attach many types of accessories. 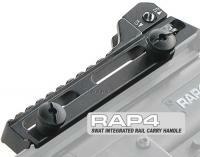 Add the SWAT Integrated Rail Carrying Handle to your marker and turn it into a true assault rifle. It's made of solid alloy and has the standard iron sight with elevation, windage adjustment gear, and an integrated rail. The SWAT Integrated Rail Carrying Handle lets you mount all types of scopes, sights or any type of attachments you can think of.